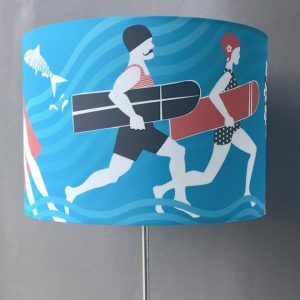 Contemporary Lampshades, Surf Art, Flower art, fabric, prints, greeting cards, cushions and other gifts for coastal decor. Yellow lovers, floral and botanics, Cornwall lovers, birds, flowers, seaside and surf themed gift ideas. 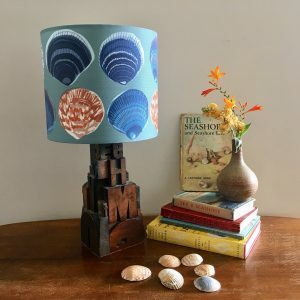 She sells lampshades on the seashore! 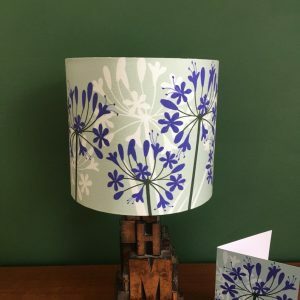 I am Alison Bick, a designer living in Cornwall, UK. 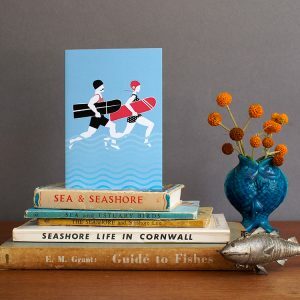 The inspiration behind my illustrations comes from my love of nature, birds, daily dog walks, my family’s surfing heritage in Cornwall, vintage swimwear, foraging, beach-combing, the flowers in my garden and visiting botanic gardens. Each one of my illustrations has a story behind it that is personal to me, but also is commonplace memory or a shared emotion. The people who like my work are gardeners, botanists, floral lovers and Cornish people from around the world. I always say, you can leave Cornwall, but it will never leave your heart! My Vintage Surf illustrations and the story behind them featured in a six page article in the October 2017 edition of COAST Magazine. Below is a small selection of my products available to purchase. 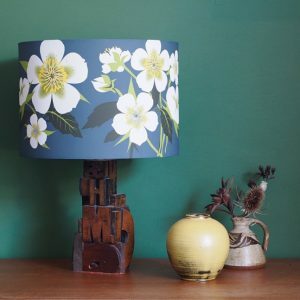 I also have an Etsy shop with most of my lampshades and prints listed, but please contact me if you are thinking about placing a bespoke order and need more info from me. 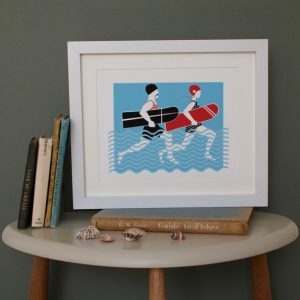 Surf art Arthur and Olive is one of the prints in my Vintage Surf range of illustrations. 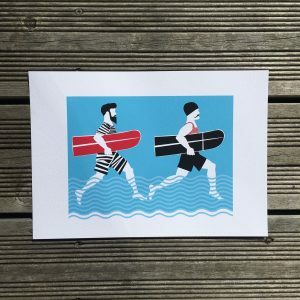 Inspired by my family’s history of surfing in Perranporth in Cornwall, by family photos of my grandparents on the beach when they were young, and by the annual World Belly Boarding Championships which take place in Chapel Porth in Cornwall. Perfect wedding or anniversary gift idea. My illustrations are inspired by my family’s wooden board surfing heritage. My grandparents (Arthur Roy and Olive Augusta) both grew up in Perranporth in Cornwall, and my grandmother’s family started surfing and making wooden boards after the First World War. I remember my great Uncle (also called Arthur) taking his wooden belly board down to the beach at Perranporth when he was well into his 70s! His son told me recently that Uncle Arthur had made his own Malibu surf board in the 1950s. George is my new guy, he is modern vintage Cornish. He wears his hair in a quiff and sports a magnificent beard. A dapper kind of chap, he loves living by the sea, and when he’s not in it he is doing something creative like whittling a wooden spoon or cooking fresh mackerel on an open fire on the dunes, watching the sunset. 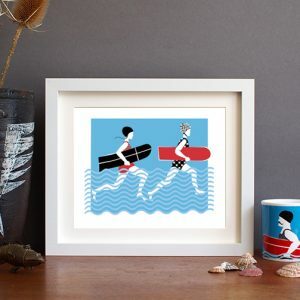 The Tamblyn Girls is a design from my Vintage Surf set of illustrations and is inspired by wooden bellyboard surfing. A couple of surf girls splashing into the water with their wooden belly boards.